it looks like they're getting closer to knowing the answer. Photo courtesy of Creative Loafing Tampa. The other day, I noticed a headline in one of my news feeds that proclaimed: "Plants Can Talk to Each Other and Respond to Sound." I was immediately reminded of the Michael Pollan book, The Botany of Desire, which posits that plants have had an agenda of their own as they have evolved with humans. This agenda, namely to increase their chance of propagation and survival, had a great impact on human society and development. Certain crops were especially successful - think of plants like corn, wheat or apples that have been grown in massive numbers around the globe. In essence, Pollan gave plants agency; he demonstrated that there may be more going on than meets the eye when it comes to the plant kingdom. We are growing increasingly doubtful of the idea that all acoustic emissions by plants are the mere result of the abrupt release of tension in the water-transport system...Recent evidence illustrates that the young roots of corn generate structured, spike-like, acoustic emissions. To date, the production mechanisms and adaptive value of such acoustic emissions remain elusive, yet in the past two decades several studies have pointed to the phenomenological importance of sound and vibrations in plant physiology...We propose that the potential adaptive functions of sound in the life of plants have not been explored to their full potential, leaving serious gaps in our current understanding of the sensory and communicative complexity of these organisms. A little disappointed that the study didn't exactly show that plants are communicating with sounds (and surprised that the news media would declare a non-finding as a new discovery), I decided to see if anyone had shown that plants "talk" audibly with each other. 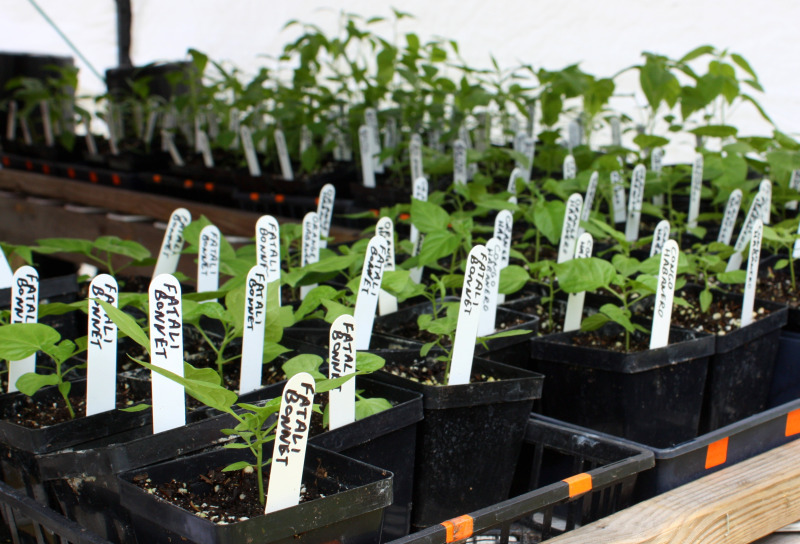 I came across another study, published earlier this year in PLoS ONE (this one is open access and can be read here), that offers references to a number of studies that demonstrate various types of plant communication and adaptation, and then goes on to discuss the authors' study that sought to demonstrate communication through sound among chili pepper plants. I wondered if their language is as hot as they are!. In this study, titled "Out of Sight but Not out of Mind: Alternative Means of Communication in Plants,"
the authors were able to show that plants do communicate - and in a way other than through physical contact (above or below ground), or through chemical or light-mediated signals. They showed that plants can actually sense their neighbors, and react to some plants differently than others. They even grow differently based on their neighboring plants. But.... the authors did not show that plants use sound to communicate! Sound may be another modality by which plants exchange information. Decades of scientific research has measured and described sound waves produced by plants as well as the effects of sound on plants such as changes in germination and growth rates as well as physiological responses. Moreover, both emission and detection of sound may have adaptive value in plants and while we still don’t know how sound is perceived in that we are yet to identify receptor mechanisms and study their function, we have clear evidence about plants’ ability of detecting vibrations and exhibiting a selective sensitivity on the basis of which they modify their behavior. So it looks like we're not yet quite sure if plants can talk. We know they communicate in a number of ways, and we know sound can influence their growth. We know they can make sounds, but we aren't sure what for. It would appear that we are getting closer to finding out. All I know is that I'll keep talking to my plants and now I'll be wondering what they're saying about me! I wonder if healthy plants are happy plants? Is there more to it than that? Whether with sound or not, I am still amazed that plants can sense what is around them and grow differently based on that. I've found that my houseplants seem to do better in rooms that I don't go in a lot. Wonder if they don't like my voice!